We are an Australian Charities and not-for-profits Commission registered organisation. We work in partnership with a wonderful organisation in Nepal called NHEDF (Nepal Healthcare Equipment Development Foundation) and facilitate medical care, surgical intervention, nursing care, physiotherapy and rehabilitation services for people in Nepal who experience life changing injury or illness (including obstetric fistula) and cannot access medical care due to poverty. We change the lives of people who have no one else to turn to and nowhere else to go. Many of NHEDF’s patients, including women with fistula (and we now run our fistula program through NHEDF) cannot return to their pre-injury employment due to their disability. Our Circles of Hope initiative will provide skills training and flexible Shelter and home-based employment once it is up and running. 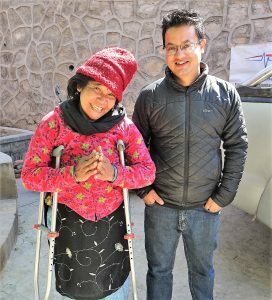 At Roads to Rehab Nepal we rely solely on donations, and our work has been made possible by generous people who care about humanity, disability, inequality, access to health and medical care, and the challenges faced by people living in Nepal in accessing an unjust medical system. There are many ways to get involved, effect change and build a future for those who we support. Changing their world starts with a single step so explore our website and travel down their often long road to rehabilitation with us and help us change the lives of one patient at a time.